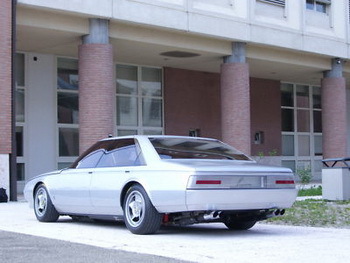 The work of Sergio Pininfarina, the Ferrari Pinin four-door concept was dedicated to his father Battista 'Pinin' Farina, who was the founder of the Turinese design and engineering house. 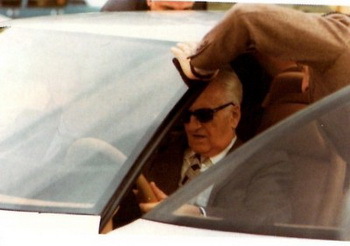 Reportedly Enzo Ferrari was impressed with the Pinin concept sedan, even favourably discussing a limited production run with Pininfarina, although this eventually fizzled out. The legendary Ferrari Pinin, a concept that dramatically shattered Prancing Horse preconceptions by boasting four doors and which was created by Pininfarina to celebrate its 50th anniversary in 1980, has gone on sale. In the run up to the 1980 Turin Motor Show rumour had abounded that Pininfarina would be as bold as presenting a four-door car to grab the headlines on the occasion of its 50th anniversary, but this was dismissed as Ferrari's simply don't come with four doors - this was Enzo's creed, a fundamental principal that has run steadfast throughout the company's history. Only the Pinin has dared to stand up and challenge this philosophy. In the event the Ferrari 'Pini' stunned the automotive world when it debuted at the Turin Motor Show, on Pininfarina's home turf. 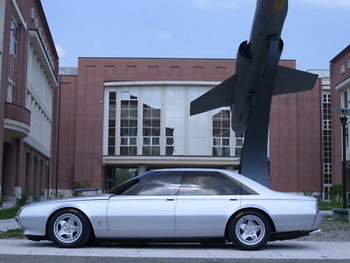 The work of Sergio Pininfarina the concept was dedicated to his father Battista 'Pinin' Farina, who was the founder of the Turinese design and engineering house. 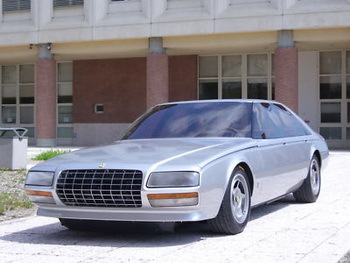 The first Ferrari with four doors - only a company with the deep and long association that Pininfarina had with Maranello - could pull off such a brazen move; it was also the first time that Ferrari's 4,943 cc, 180-degree, 12-cylinder 'Boxer' had been seen positioned in front of the driver. 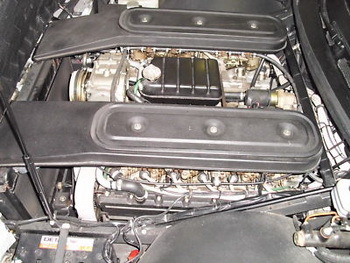 For the Pinin application, the engine was rated at 463 CV. The lines were sharp, clean and stylish, and the design is still as fresh and relevant today as it was then three decades ago. 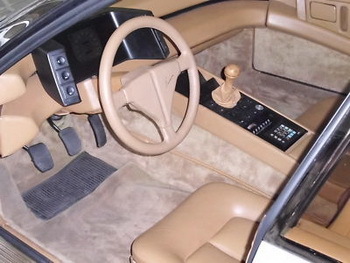 Inside, it was a very similar story with the cabin, which has a well thought out ergonomic layout, is trimmed in high quality leathers, features an innovative driver-focused instrument console and a rear control panel for passengers to operate the power windows and entertainment system; it still exudes a modern feel. Reportedly even Enzo Ferrari was impressed, discussing a limited production run with Pininfarina, although this eventually fizzled out. However this tale is dismissed by the late prolific Ferrari collector Jacques Swaters who acquired the Pinin. When key components of his collection was sold by RM Auctions at its Ferrari: Leggenda e Passione sale in Fiorano in 2008, they noted in the auction catalogue: "According to Swaters, when Enzo Ferrari heard of the construction of the Pinin, he strongly opposed it based on the sole reason that Ferraris are race cars and not limousines, and hence were to be restricted to the two-door variety. As a result, construction of the Pinin was interrupted and the car was never motorised." Either way the Ferrari Pinin, after a high profile tour of the world's top motor shows, was consigned to become a novelty of history, disappearing from view. In 2008 it was however back in the public eye as one of the headline lots of the Ferrari: Leggenda e Passione auction in Fiorano as a chunk of the illustrious Jacques Swaters collection went under the hammer. Swaters, a Belgian former racing driver and Ferrarista of some note who built an impressive collection, ran the famous Ecurie Francorchamps team. According to RM Auctions, who managed the sale for Ferrari, "this one-off prototype was reportedly given to Jacques Swaters by Mr. Pininfarina himself." It was accompanied by various documents from engineer Angelo Bellei. The new owner of the Pinin was Modena-based high end car concern, AutoSpeak and they quickly shipped it off to Oral Engineering, the concern headed up by famous former Ferrari engineer Mauro Forghieri, to restore the car and put it into running order. Two years of work has seen the Pinin returned to the glory days of the 1980 Turin Motor Show; and last year it grabbed visitors attention when it made a headlining appearance on the manicured lawns of the Cartier Style et Luxe paddock at the Goodwood Festival of Speed. Now it is up for sale, with a price tag, including taxes, of 1,200,000 euros. "The car runs very fast and is very comfortable; it's a little piece of history of Ferrari and Pininfarina," AutoSpeak's Gabriele Candrini told Italiaspeed this week, "It's a rare Ferrari prototype for a very important Ferrari collection."